Choose from three fast and efficient, tape-less casting systems from Galileo. Galileo's RapidCast system is ideal for most small gel units with trays that are approximately equal in width and length. The dimensions of all Galileo cast-in-place gel trays are adjusted so that when the tray is placed cross- ways in the gel tank, the gasketed ends of the gel tray fit precisely against the walls of the buffer chamber. This forms a leak-proof seal for quick gel pouring. This system can also be used with RapidCast casters, for casting outside the buffer tank. A long-lived silicone rubber gasket ensures a reliable seal thru many gel castings and side grooves on all RapidCast trays provide for easy handling. All Galileo trays feature multiple comb slots, built-in fluorescent rulers and ultra-strong assembly methods for long, reliable service. High thru-put / high resolution systems require gel trays too long to fit cross ways in the gel tank. 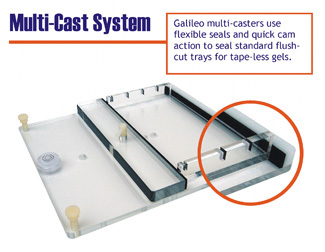 For easy tape-less casting with these units, Galileo has developed the ExpressCast™ system. 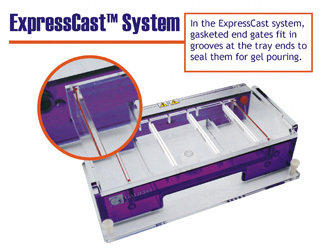 ExpressCast trays incorporate removable gasketed end gates. These end gates fit into slots at both ends of the tray, to form a quick leak-proof seal for gel casting. Because the length of ExpressCast trays is not constrained by the width of the gel unit, these trays can accommodate longer run lengths or more sample capacity. Note that for easy upgrading of your old units, Galileo ExpressCast trays are also compatible with gel units from many other manufacturers. All Galileo trays feature multiple comb slots, built-in fluorescent rulers and ultra-strong assembly methods for long, reliable service. For those wishing to use traditional trays, Galileo also supplies, standard flush-cut trays for many units. The two sizes of adjustable multi-gel casting platforms from Galileo, enable quick leak-proof casting of multiple gels using flush-cut trays. These casters accomodate a wide range of tray sizes and styles, and quickly seal both ends with a simple turn of the accuation cam. Note that for easy upgrading of your old units, Galileo flush-cut trays and multi-casters are also compatible with gel units from many other manufacturers. All Galileo trays feature multiple comb slots, built-in fluorescent rulers and ultra-strong assembly methods for long, reliable service. 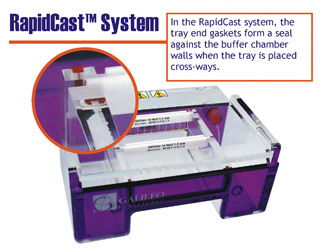 The RapidCast system includes gasketed trays precisely sized to fit inside each different sized gel unit. Also available are rapid cast gel casters, "U" shaped acrylic casters which are sized to seal against the ends of the gasketed trays. RapidCast casters hold up to three corresponding trays and are availble with or without trays. ExpressCast components include additional end-gated trays and replacement gaskets. ExpressCast trays are versatile and can be used with many gel units from other suppliers, as well as Galileo brand devices. The minicast platform combines simple set-up and a leak-proof design for quick casting of small format gels. The platform has long-lasting neoprene seals and cam positions for 7cm, 10cm and 14cm long gels. A quick half-turn of the cam lever forms a leak-proof seal, and built-in leveling bubble and screws ensure even gel thickness. The multicast platform is the big brother of the minicast sytem, and has the same simple set-up and a leak-proof design for quick casting of larger gel sizes. The platform has long-lasting neoprene seals and cam positions for 7cm, 10cm, 14cm and 21cm long gels. A quick half-turn of the cam lever forms a leak-proof seal, and built-in leveling bubble and screws ensure consistent thickness across your gel. Need additional trays or combs for your existing systems? Galileo trays and combs are compatible with many electrophoresis units.